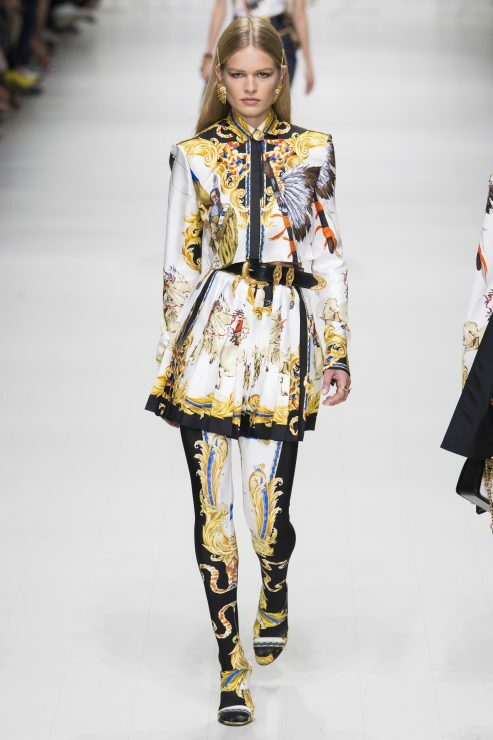 You are currently browsing the archives for the tag 'baroque'. 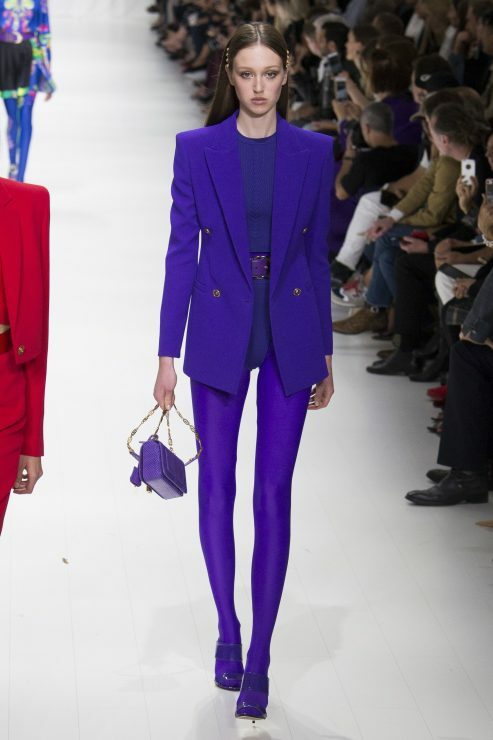 Pure Prada. 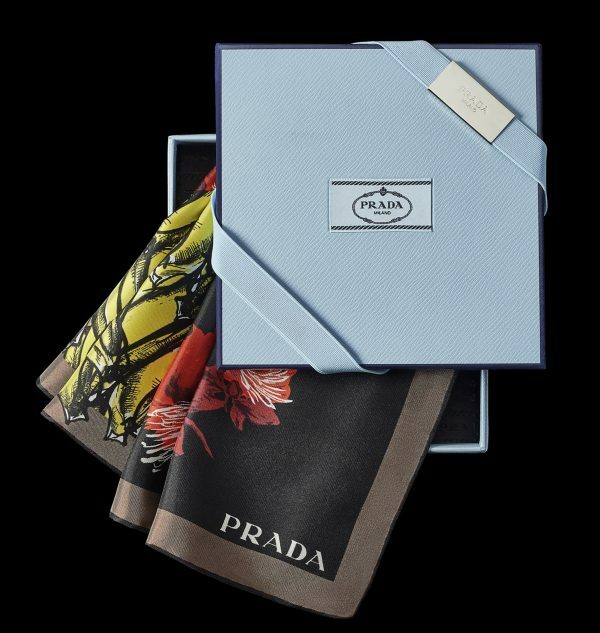 A new collection of foulards and scarves create a new wardrobe of Prada prints, drawing on emblematic patterns and approaches from the Prada archive and current seasons, rediscovering and reworking them afresh. 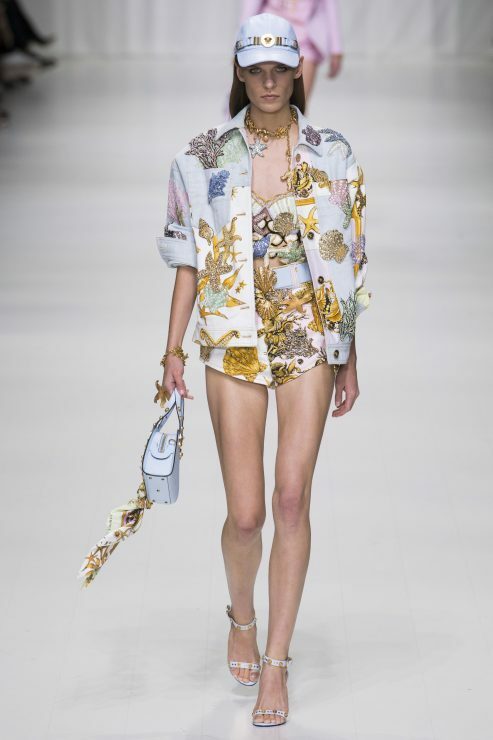 They are used to create timeless accessories – definitive accents to a look, across four themes: DOUBLE MATCH, PITTORESQUE, BAROQUE and FANTASY. 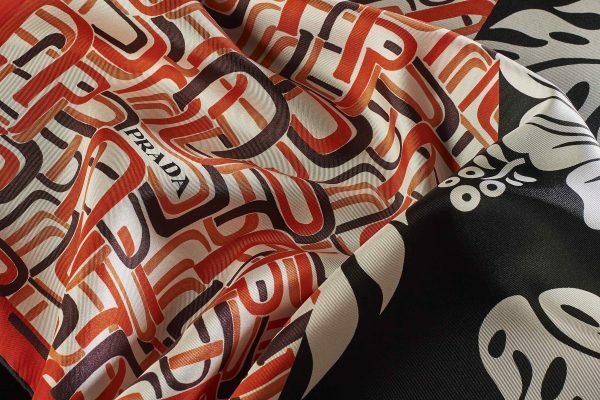 The ‘DOUBLE MATCH’ group boldly combines signature yet contrasting Prada prints as inspired by the striking juxtapositions from the Prada Pre-Fall 2018 womenswear collection – icons, approached iconoclastically. ‘PITTORESQUE’ showcases hand-drawn picture-postcard views of significant cities around the world – Milan to London, Moscow to Shanghai, a wide-ranging global journey in brilliant hues. 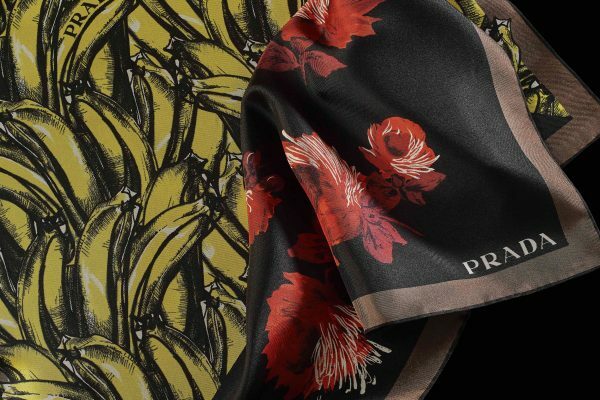 The ‘BAROQUE’ foulards draw inspiration from the seminal graphics of the Prada S/S 2011 ‘Minimal Baroque’ collection, for a sumptuously-coloured duo of scarves in patterns influenced by the curlicues and arabesques of barocco décor. ‘FANTASY’ proposes fantastical illustrations of the impossible – a surreal world of the feminine and the floral depicted by James Jean and Jeanne Detallante, the wild reveries of Prada. 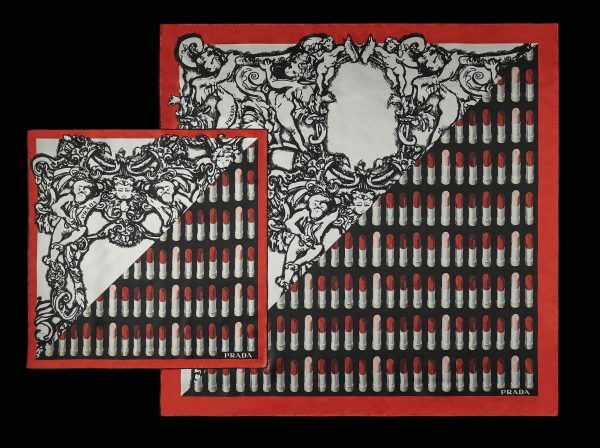 Offered in a spectrum of sizes – both square and rectilinear – the foulards are crafted from silk-twill with hand rolled edges. 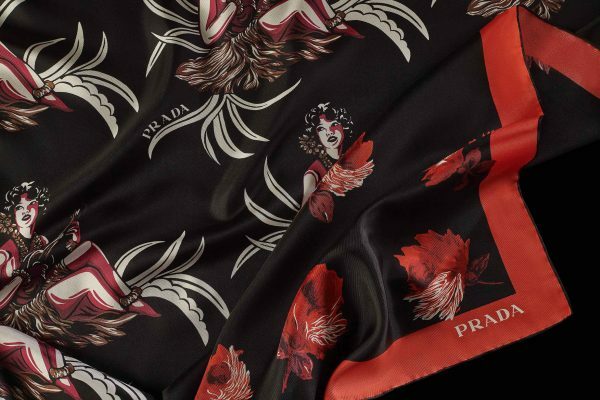 The Prada ‘DOUBLE MATCH’ foulard collection is on sale now; the accompanying trio of collections will join throughout the beginning of 2019, offered to clients at selection of Prada boutiques across the world, and via the digital flagship prada.com. 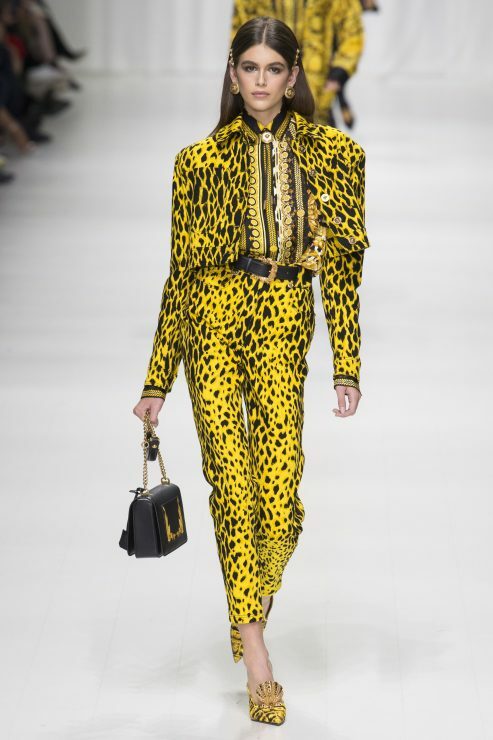 Gorgeous as her mother in the nineties… Kaia Gerber, daughter of Cindy Crawford, on the Versace S/S 2018 catwalk. 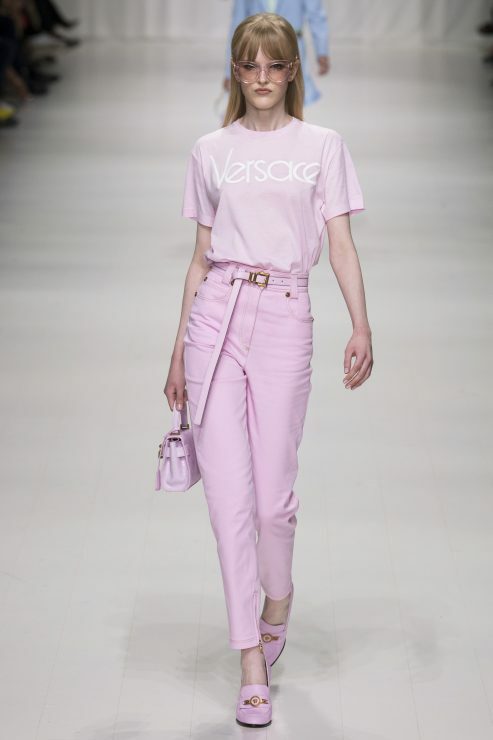 This week, Donatella Versace chose to stage her S/S 2018 show at Milan’s Triennale museum as a tribute to her late brother’s Gianni’s inspirations and creations. 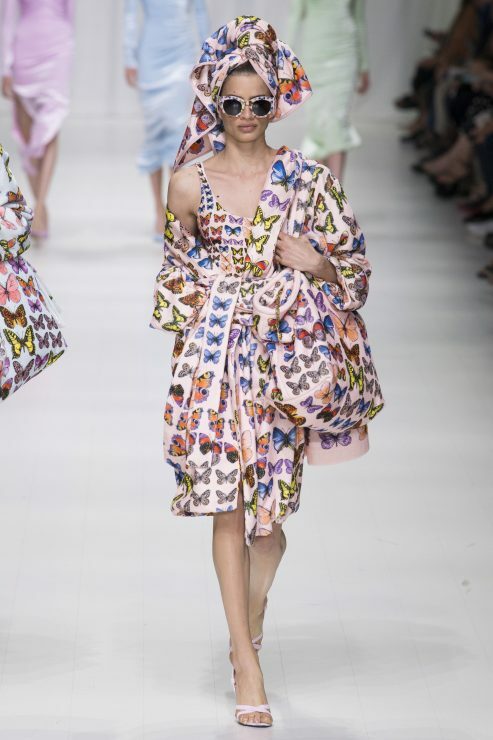 And so, for the first time since being the creative director of the company, she seeked inspiration directly from the house’s archives with all the key prints and pieces from the years 1991–95. 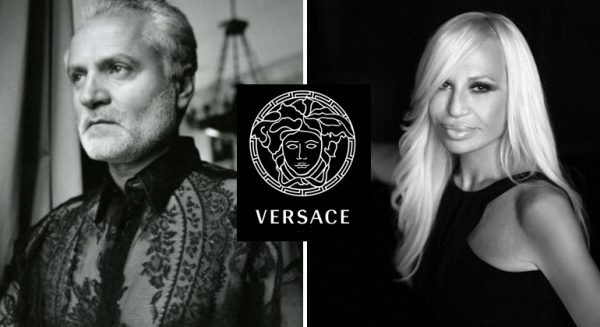 As I said those years marked the highlights of Gianni Versace’s designs. 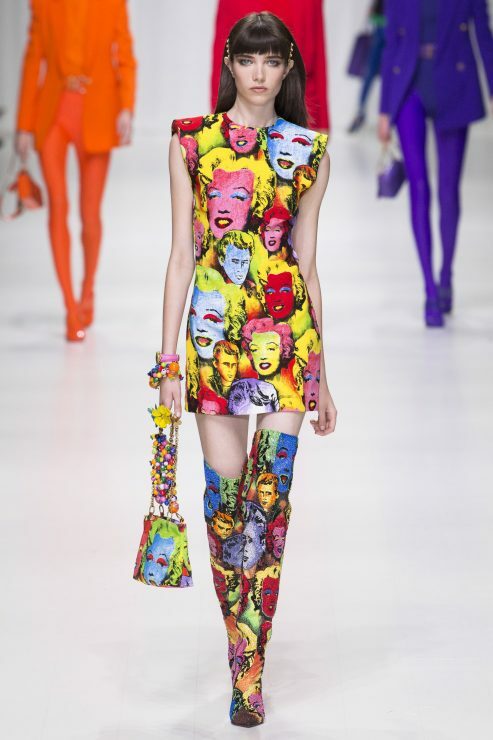 His most iconic collections included Vogue, Warhol, My Friend Elton, Icons, Baroque, Animalia, Native Americans, Tresor de la Mer, Metal Mesh, and Butterflies. 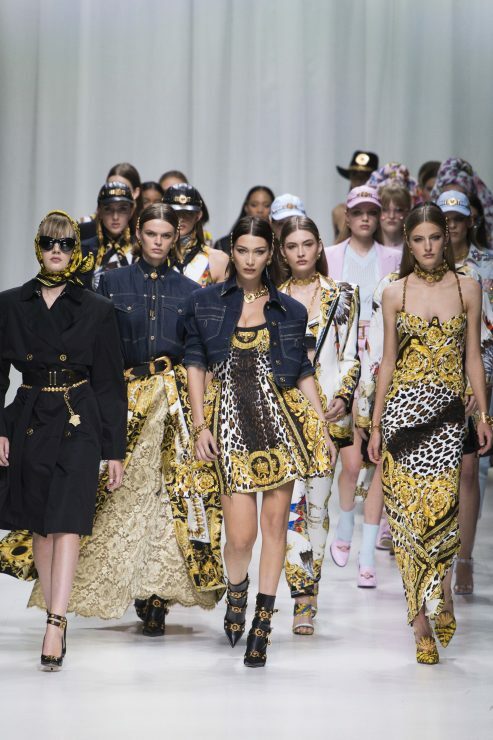 Beautiful finale of the S/S 2018 Versace: Carla Bruni, Claudia Schiffer, Naomi Campbell, Cindy Crawford, and Helena Christensen posing in classic Versace chainmail dresses. To celebrate «a genius . . . an icon . . . my brother» as Donatella said, the show fulminated in a finale that brought tears to my eyes. 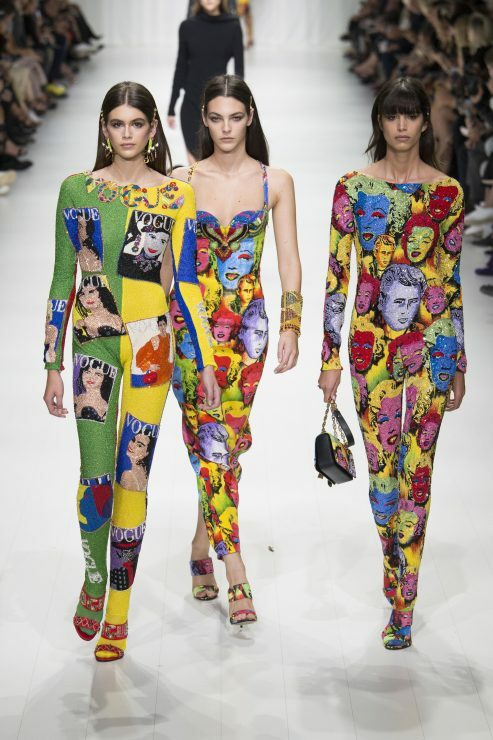 Gianni’s favorite models, Carla Bruni, Claudia Schiffer, Naomi Campbell, Cindy Crawford, and Helena Christensen, appeared in golden gowns on stage, to the chorus of George Michael’s «Freedom! ’90.» Front row? 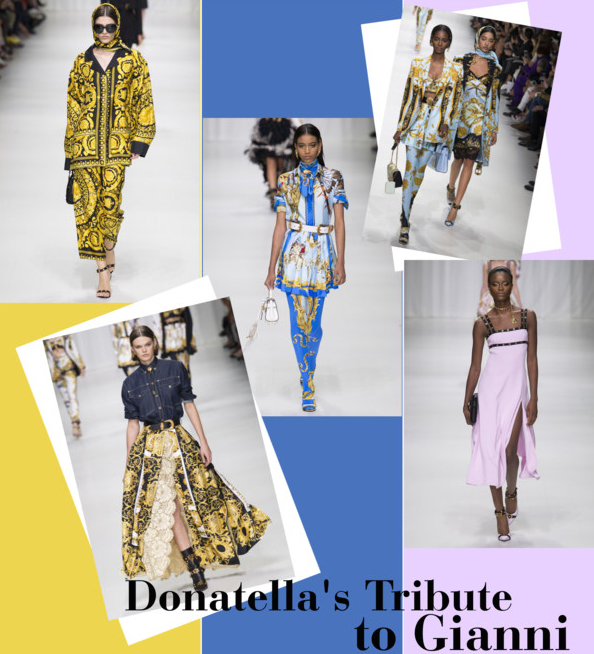 Alessandro Michele, Anthony Vaccarello and Pierpaolo Piccioli applauded to Donatella’s tribute to the late master of fashion. Linda Evangelista, Cindy Crawford, Naomi Campbell and Christy Burlington lipsynching to George Michael’s «Freedom 90» for the finale of Gianni’s Versace’s F/W 1991 show. 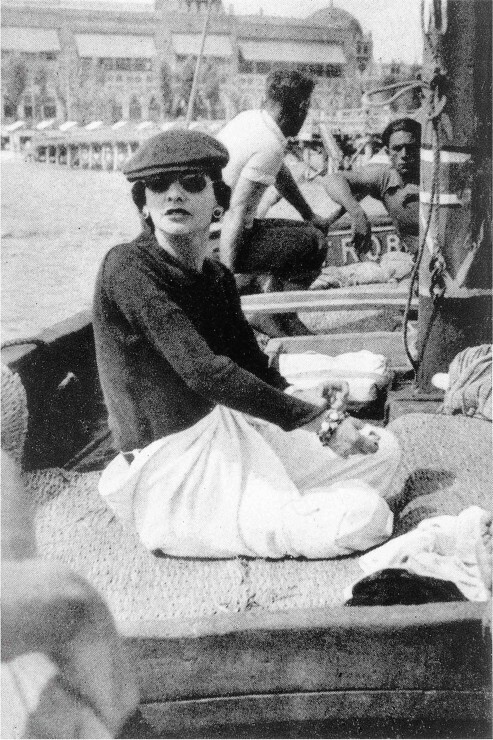 Back then fashion was truly fun! The era of the top models: Gianni Versace surrounded by them in 1991. 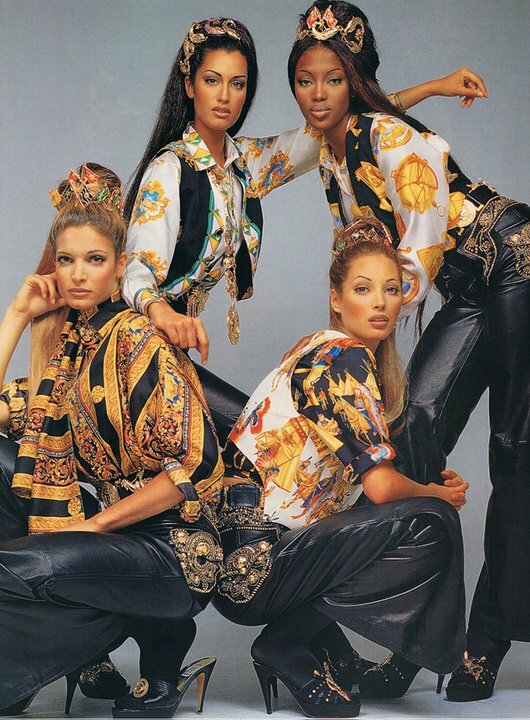 A beautiful Versace ad campaign from the ’90s. 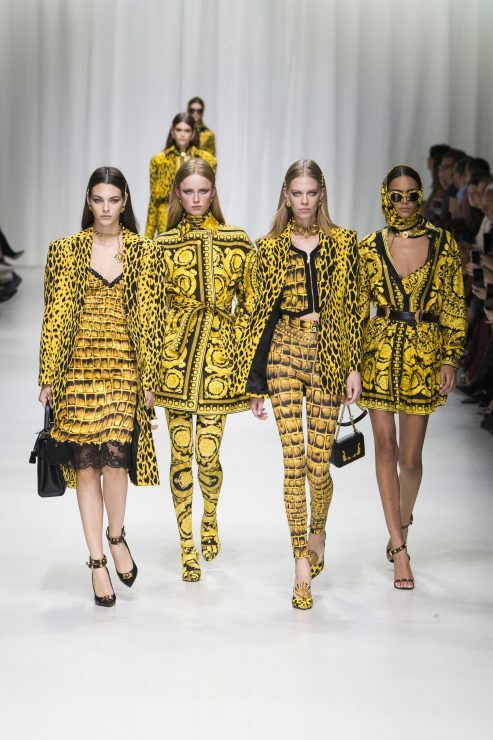 This moment reminded me why I chose many years ago the direction of fashion and how much the work of Gianni Versace in the ’90s had inspired me to do so. 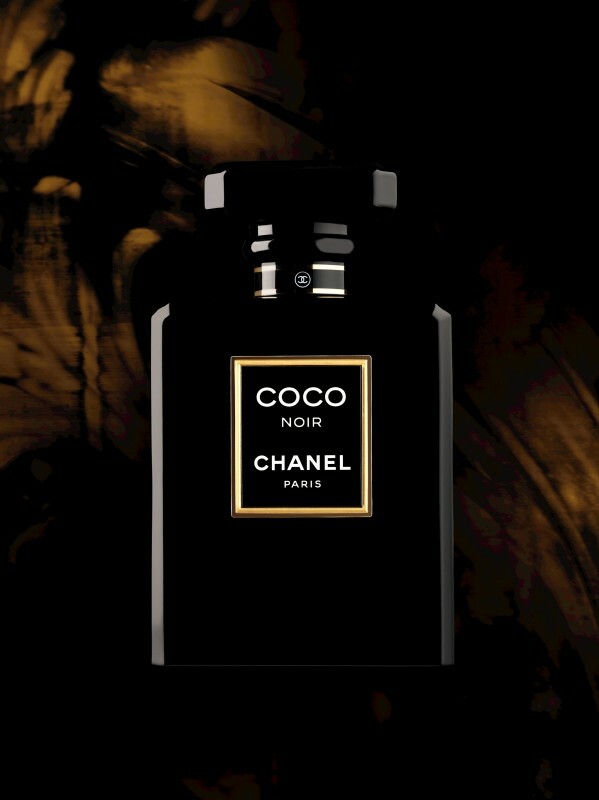 Finally, I can tell you very exciting news for all fragrance aficionados and Chanel lovers among you: COCO NOIR is here, Chanel’s newest fragrance. The famous French house didn’t want any information to go public before and journalists and bloggers had to sign a press embargo not to post the information earlier. 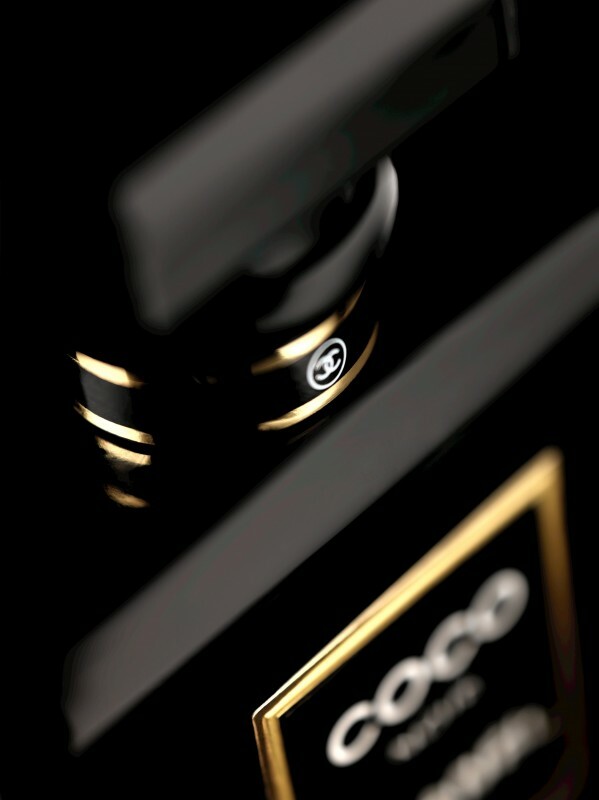 COCO NOIR is the third fragrance named after house founder Gabrielle “Coco” Chanel, joining Coco (1984) and Coco Mademoiselle (2001). 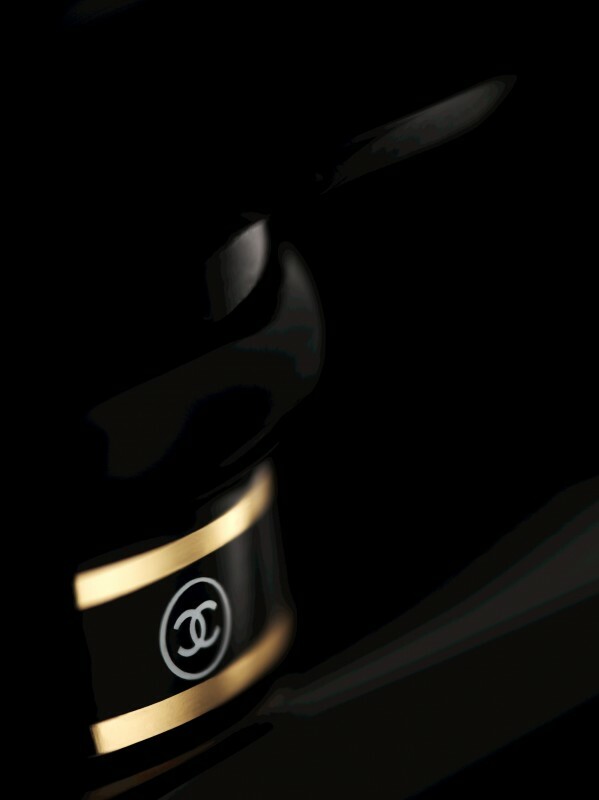 Created by Chanel’s master perfumer Jacques Polge, it represents Coco Chanel’s love of the “dazzle of black and Venice”. Available in 50 ml (CHF 146.-) and 100 ml (CHF 210.-). In Switzerland from August 20, 2012. 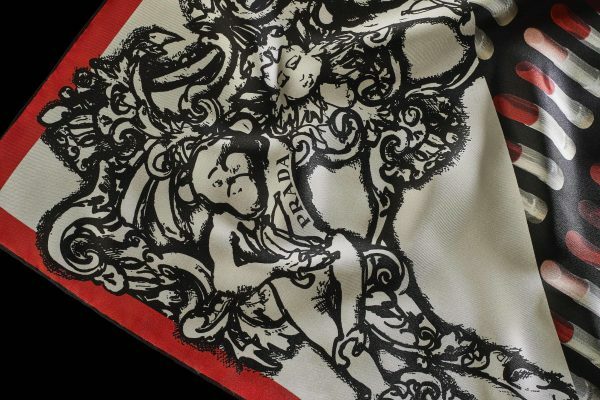 COCO NOIR has an “animal sensuality – a great nocturnal Baroque”. The perfect scent for the next season to finish off you opulent winter looks. If you like oriental fragrances, this will definitely be something for you.